Keywords what a big headache! 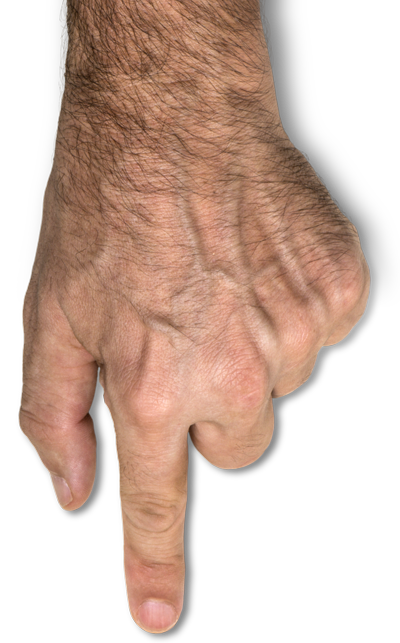 Here're some tricks and a little secret to find your most rewarding ones. Yes I know, it can be an annoying task since there’re hundreds of combinations and variations to consider... let me correct the last sentence, it WAS an annoying task, because now with our completely free Keywords Mixer and its simple integration with your preferred search engine , you can generate all your precise search phrases in just one click. 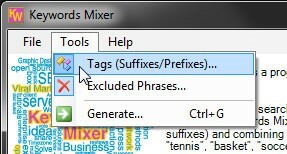 Keywords Mixer allows you to dynamically generate search phrases, building them from 3 basic bricks (prefixes, keywords and suffixes), combining them in the desired permutations and subtracting from the result all the phrases you decided programmatically to exclude. 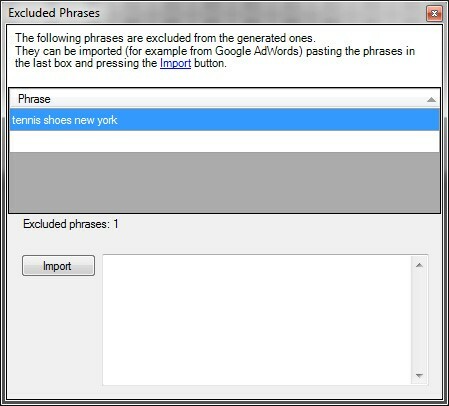 Let's use an example to explore Keywords Mixer features, supposing we want to sell sport shoes in different towns around the globe: a typical search phrases may be tennis shoes venice, soccer shoes new york, etc. Open the Tools > Tags form to start entering our base bricks. 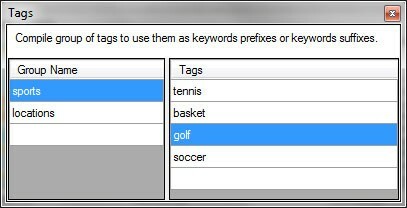 Create a group of tags named sports that will contain all the sport our shoes apply to; fill the group with the desired sports, in our case tennis, basket, golf and soccer. Create a second group of tags named locations and fill it with all the locations where we have our stores, in our case venice, milan, rome, paris, london and new york. Now it's time to start design our search phrases, combining sports, shoes and locations. The only thing we have to do is enter a single row into the main form's list, using sports as prefixes, shoes as the keyword and locations as the suffixes. 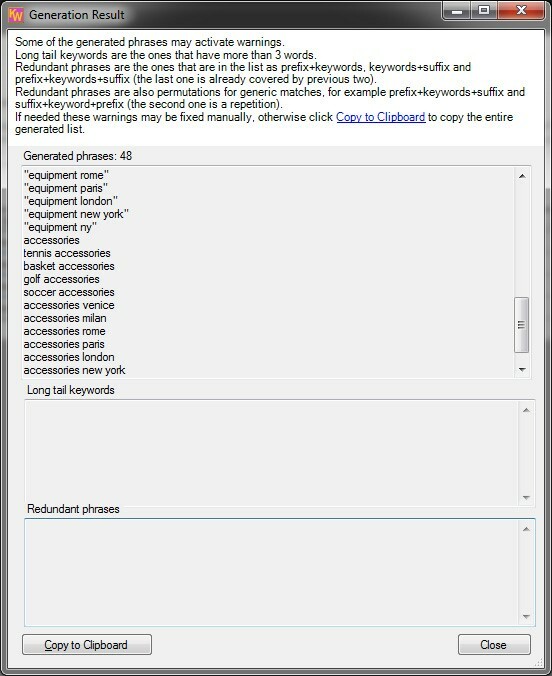 The check boxes present on the keyword row are used to design the generated phrases. The Match Type column is used to declare the keywords match type (generic match, phrase match and exact match) as specified in the Google AdWords documentation. In our example leave the box unchecked. Since it may be not immediate to understand the result of checking a permutation, place the mouse pointer over a check box and the program will generate a tooltip sample with your data. In our sample let's check 2, 1+2, 2+3 and 1+2+3. To generate the search sentences, use the Tools > Generate command. The most important text box is the Generated phrases one, it tells us that 35 permutations have been generated (all reported in the text box). Long tail keywords: the text box advises us that 4 phrases have more that 3 words and usually users do not search for so long phrases. This is not always a warning, sometimes it is good to bid on long tail keywords to raise the quality of our visitors. If we use 1+2, 2+3 and 1+2+3 all the the last phrases are already covered by the first two: for example if we generate "tennis shoes" and "shoes venice", the phrase "tennis shoes venice" is superflous. We decide to remove the 1+2+3 check from our row. If we use 1+2 and 2+1 with a generic match, the second one is superflous because generic matches already consider permutations. Let's generate again with the previous changes and check that less sentences have been generated and all warning are disappeared. 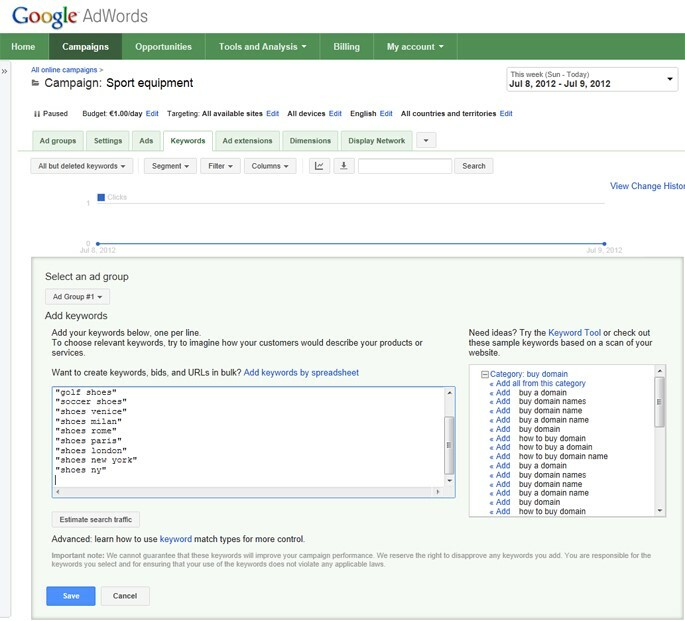 To add this phrases to our Google AdWords advertising campaign, press the Copy to Clipboard button and paste the result directly into the Google AdWords keywords box. Imagine that in our stores we don't sell only shoes, but many different sport accessories. As the story goes more complicate, it is clear that handling all permutations without Keyword Mixer needs a titanic effort with many chances to make mistakes. In our case, to add other equipment sold in the same towns and for the same sports, we need only to add rows to the main list using the same tags. What can we do if in our example the New York store doesn't sell tennis shoes? 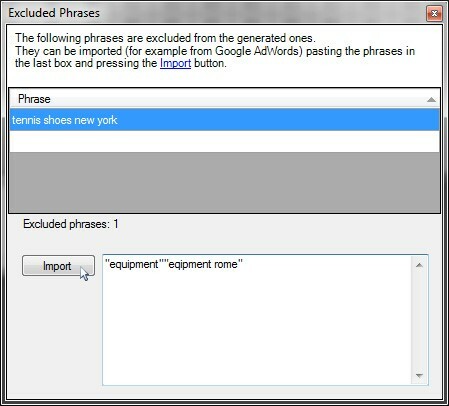 Enable again the 1+2+3 check box for the sports+shoes+locations row (we will ignore the too long phrases generation warnings). Open the Excluded Phrases tool window using Tools > Excluded Phrases. Add a tennis shoes new york row. The excluded keywords can be restricted to phrase or exact matches, enclosing them between doble quotes or square brackets. The form can be used also to include low search volume phrases or low quality phrases after the Google AdWords campaign creation. Filter your Google AdWords keywords, showing only the ones you want to remove and exclude from future generations. 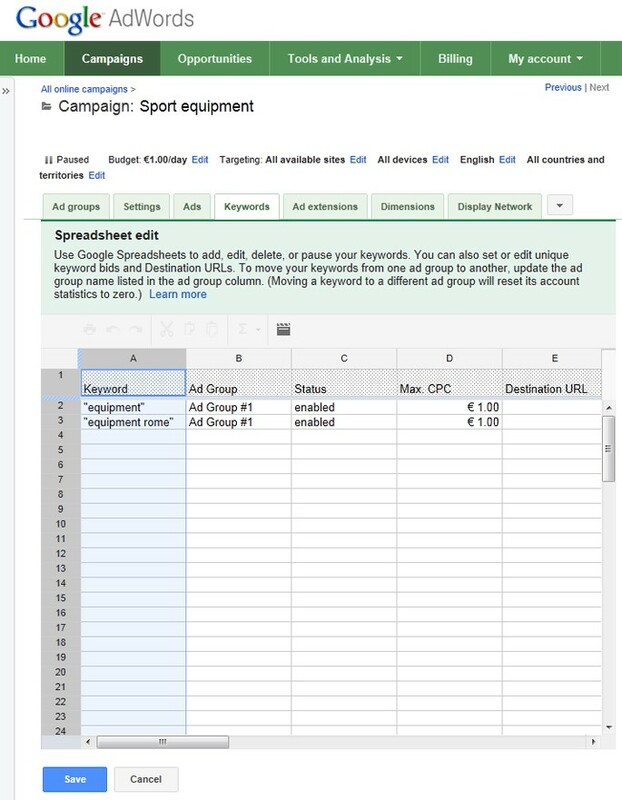 Change the Google AdWords view into spreadsheet view. 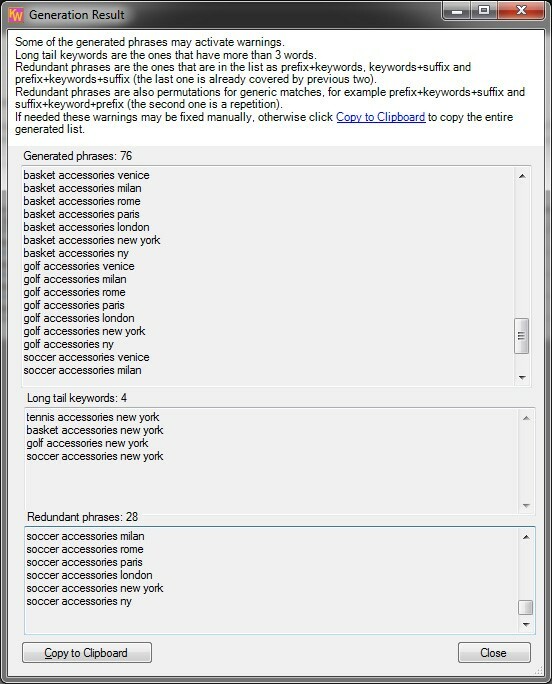 Select and copy all the Google AdWords keywords column. Paste the copied data into the text box close to the Import button in the Excluded Phrases tool window. Press the Import button and that's all. 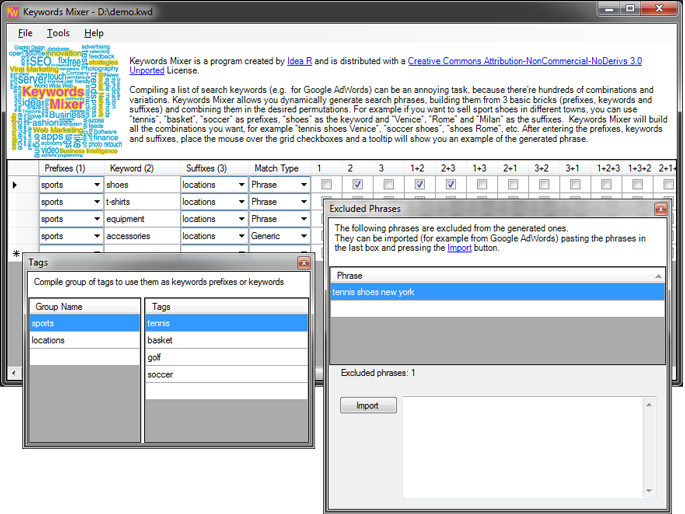 Keywords Mixer, the free web marketing tool. You are the reader number 16,558.